The Nublar tufted deer (Elaphodus cephalophus nublarus) is a fictional subspecies of the tufted deer (Elaphodus cephalophus), native to Isla Nublar. This deer, a close relative of the muntjacs (genus Muntiacus), is about two feet tall (.6 meters) in height, and is described as nocturnal. However, the deer has also been observed during the daytime under the darkest parts of the jungle canopy. The Nublar tufted deer is described as the most common of the species native to Isla Nublar. Along with the rest of the native species, the Nublar tufted deer was protected by law. An agreement was signed in 2005 with between Masrani Global Corporation and the Costa Rican Environmental Protection Society to ensure the safety and habitat of the indigenous wildlife of Isla Nublar. Most intriguing is that the Nublar tufted deer is the only member of the genus Elaphodus, or species E. cephalophus itself, found outside of Eurasia. 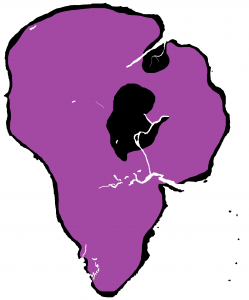 The typical distribution of species in this genus is China (where most of the population and subspecies reside: namely E. c. cephalophus, E. c. michianus, and E. c. ichagensis), Myanmar (home only to the non-Chinese range of E. cephalophus cephalophus), and Afghanistan (reported to have been sighted recently in the country after being extirpated 60 years previously); there is a fourth, albeit currently disputed subspecies (E. cephalophus forciensus), with a distribution as unclear as its validity. 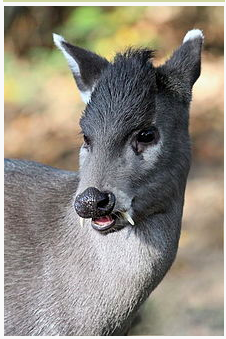 Pictured: A related subspecies of tufted deer, Elaphodus cephalophus michianus, found in southwestern China. 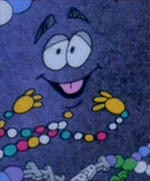 This individual is a male, identified by its fang-like canines. The Nublar tufted deer grows to two feet (0.6 meters) tall. Assuming it closely resembles real-life tufted deer subspecies, it would have a somewhat long neck and long legs, making it appear taller, and be gray to brown in color. The coat of the tufted deer is made of stiff, short hairs. Tufted deer are named for the horseshoe-shaped hair tuft found on the forehead. Nothing is currently known about the growth stages of the Nublar tufted deer. In real-life tufted deer subspecies, the primary difference between males and females is in the anatomy of the head. Males have a pair of fang-like canine teeth, which females lack. These fangs may be an inch in length. Males also have short antlers, though these may not be visible due to the tuft of hair on the head. The Nublar tufted deer is the most common endemic species on Isla Nublar, and is found nowhere else in the world. Its closest relatives, other subspecies of Elaphodus cephalophus, are found mainly in China, with possible populations in Myanmar and Afghanistan; there are currently no hypotheses with solid evidence to explain how a subspecies occurred on Isla Nublar, Costa Rica. Unlike other subspecies of tufted deer, E. c. nublarus do not inhabit mountain habitats. Instead, they are mostly found in jungles, though Isla Nublar does have some smaller mountains as well. Avoiding open spaces, the Nublar tufted deer is typically found in shady areas. In real life, tufted deer can tolerate some habitat disturbance and adapt to regions where humans live. The presence of dense undergrowth, abundant water, and salt licks are all beneficial to tufted deer. Though the Nublar tufted deer was very common on Isla Nublar as of 2015, it is unknown if any survived the June 23, 2018 volcanic eruption of Mount Sibo. If any did survive, they would have faced a dramatic loss of food and habitat. It is possible that this subspecies has become completely extinct. The Nublar tufted deer is generally described as nocturnal. However, it is sometimes active during the daytime, meaning that it is likely actually crepuscular (active at dawn and dusk); real-life tufted deer are also crepuscular, so this is a plausible scenario. 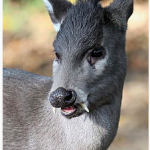 Tufted deer are herbivorous. As they are found in both evergreen and deciduous forests, it can be inferred that they feed on plants found in these types of environments, but no specific information about their diet on Isla Nublar is known. In real life, the male tufted deer vigorously patrols his territory along fixed trails and will defend it against rivals. They are mainly solitary animals, but can be found in pairs. In real life, the mating season takes place between September and December. Males make loud barking calls to attract mates. Gestation lasts six months, with one or two young being born in the early summer months. Sexual maturity is reached at one or two years old. In real life, tufted deer are almost always quiet; however, they can bark. When startled, one will bark loudly as a form of warning as it flees, and males will bark during the mating season to attract the attention of females. These small herbivores would be low on the food chain on Isla Nublar. With native predators displaced by InGen‘s establishment, their primary predators are probably carnivorous dinosaurs. In real life, males defend their territory against rivals but are timid in the face of danger. Tufted deer will hide in areas where they are well-camouflaged to avoid threats, and when attacked will let out a loud bark while bounding away with a catlike gait. Prior to the introduction of dinosaurs in 1988, the largest known carnivore native to Isla Nublar was the common boa constrictor. It would likely have been the main predator of Nublar tufted deer. Tufted deer in real life are timid and often flee from human contact, but can become tolerant of human activity. They are sometimes seen on cultivated land.